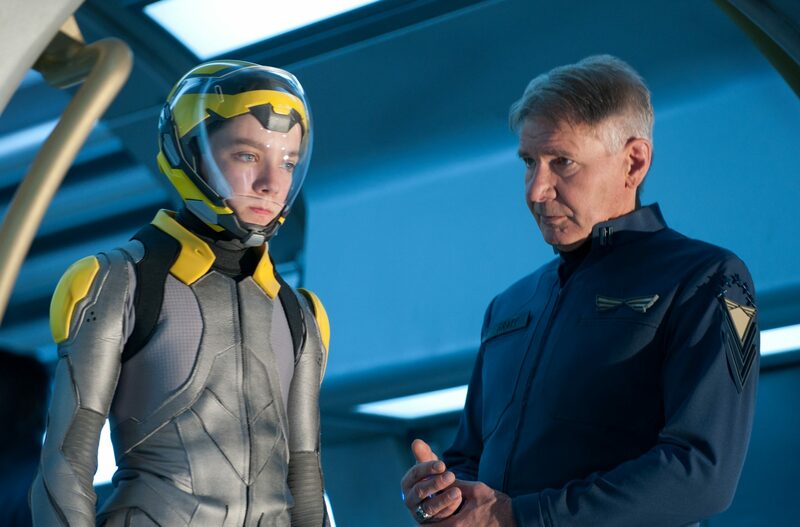 Adapted from the 1985 novel by Orson Scott Card, Enders Game tells the story of Ender Wiggin, a young recruit to Earth’s International Fleet Battle School where he’s to be trained to fight and defeat the ‘Formics’, a bug-like alien race who invaded the earth 50 years prior to the event’s of the movie. With the previous war only having been won by the heroic sacrifice of the, now legendary ‘Mazer Rackham’, the military brass have turned to recruiting the worlds young and brilliant minds to become it’s new military commanders, promising they will never be left unprepared again, should the Formics return. Asa Butterfield (The Boy in the Striped Pyjamas, Hugo) takes on the lead role as Ender, a genius, who shows an outstanding aptitude for strategy in the computer-based military war games, who is recruited by Colonel Hyrum Graff (Harrison Ford), into the Battle School, and quickly rises through the ranks. The publicity for the film describes it as ‘Harry Potter meets Star Wars’, which is horribly misleading. It really holds far more in common with Paul Verhoeven’s Starship Troopers, albeit far less visceral, tonally there are a lot of similarities. Both films look at the idea that, in order to win a war, is it okay to lose your humanity in the process? Director Gavin Hood has produced a solid enough film. The space an sci-fi aspects are handled well enough, and the subject matter is thought provoking. Butterfield is a fine actor, and carries the role well, and Ford is his usual gruff self. However, with the exception of one particularly dark twist, I found the movie somewhat slow in places, and for a film that has a number of zero-g battle game sequences, that really shouldn’t be the case. Equally, although the premise is interesting, I never felt it was pushed quite as hard as it could have been. Ultimately I can’t help shake the feeling there was a more interesting film in there, trying to escape. ← Is the removal of BBC Three as a broadcast channel a bad thing?